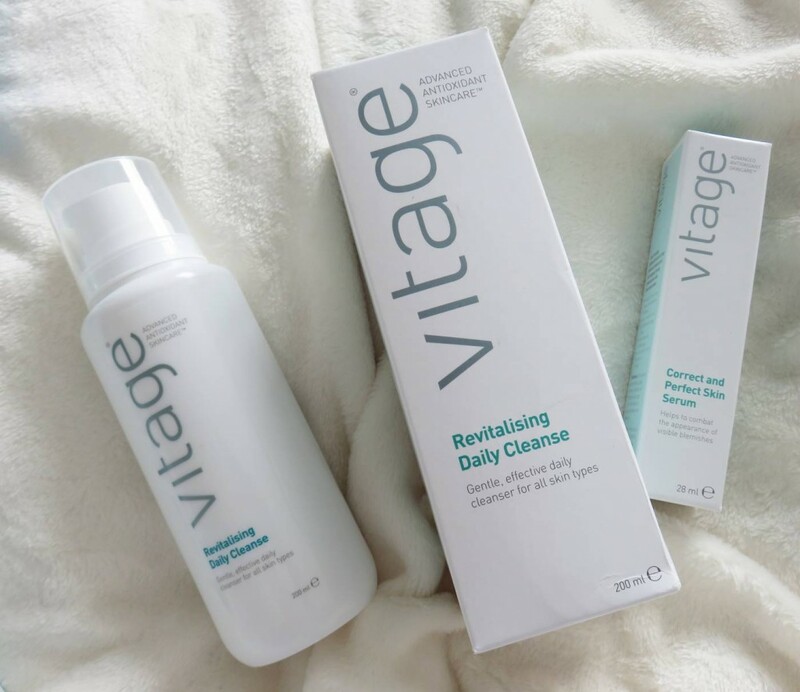 For the past six weeks, I have been taking part in a skincare overhaul where I have switched from using some of my usual, everyday beauty products I swear by (Mario Badescue, Liz Earle, Trilogy and Origins are my usual favourites) and replacing them with skincare brand Vitage. Vitage products are known for their advanced antioxidant properties, packed with vitamins and minerals to help improve and protect the skin. I’m always interested in trying out new skincare ranges which have innovative ingredients and provide a way of incorporating vitamins into my skincare regime. Revitalising Daily Cleanse, £24.00: A 200ml cleanser which I have been using as a face wash both morning and night. The first thing I loved was it’s ability to lather up – my regular Mario Badescue Enzyme Cleanser is a great wash however it doesn’t create a foam, which I guess doesn’t give you that feeling that you are really ‘washing’ the skin so to speak. It contains Aloe Vera, Hyaluronic Acid and Pantheol, which is obvious to tell as my skin feels really smooth after using this, as if the wash is moisturising my skin at the same time as cleansing. It’s also a lovely skin-calming wash, as my skin is prone to redness from using products (which luckily wears off quickly), however this gentle wash caused no redness at all and soothed any angry areas around breakouts. If you love a skin cleanser which gives velvety soft skin and boosts hydration with a calming effect, you’ll love this. Skin Defence SPF 30, £22.00. This is a lovely lightweight moisturiser which also offers high protection from harmful UVA and UVB rays. I love knowing my daily moisturiser protects to a high standard as well as hydrates skin, so I was already impressed with this product just from reading up about it. The moisturiser is enriched with what Vitage describe as ‘anti-inflammatory PhytoTerra® Organic Maté’ and ‘an anti-Oxidant rich Rosamine Vitamin cocktail’. So the ingredient list comforts me from the word go. If your skin has suffered sun damage, or you are really keen to protect yours skin from any environmental elements, the Skin Defence SPF30 reduces the effects of daily sun damage and allows skin to fight against environmental aggressors so it’s perfect for this. A silky formula which was a pleasure to use, and a great base for make-up. Vitamin C Radiance Mask, £26.00. OK so this has to be my favourite product from the selection. The Vitamin C Radiance Mask is an anti-ageing face mask which aims to hydrate and brighten the skin for instant radiance, using highly concentrated Vitamin C for high-performance. It works by stimulating collagen production to fight the ageing process, diminish fine lines and wrinkles, and create refined skin texture. I would say for me that I noticed the skin brightening and plumping effects to be more noticeable, but maybe because aging skin isn’t a factor for me just yet (for now!). It is packed with almond oil, zinc and Aloe Vera which again softened the skin and reduced any redness. I used this once a week and left on my face for 15 minutes, with no irritation, just smooth, glowing skin. I switched to this from my usual Trilogy face mask, which I equally love, so I’ll potentially switch them about a bit and use both going forward. Perfect and Protect Skin Serum, £21.00. I don’t usually use a skin serum as I normally cleanse, tone and moisturise, although I guess a serum fills the place of a regular moisturiser. So with this, i have been using it on the days where I haven’t used a moisturiser in the morning. I wouldn’t usually opt for a serum, but this one in particular I wanted to use as it lightweight treatment to minimise breakouts and prevents blocked pores as well as moisturise. Correct & Perfect Skin Serum is infused with Anti-Oxidant Vitamins A, C & E which offer anti-inflammatory and healing properties, whilst Zinc reduces excess sebum production which controls oily skin – which I am very prone to! It also contains Alpha and Beta Hydroxyl acids to fight bacteria (and I find these acids good for exfoliating the skin too) thus reduces breakouts. So far it seems to be doing what it says it does – breakouts are under control, and I don’t suffer the 3pm shine on my T-Zone when I have used this. It dries quickly too meaning I can apply make-up quickly afterwards. 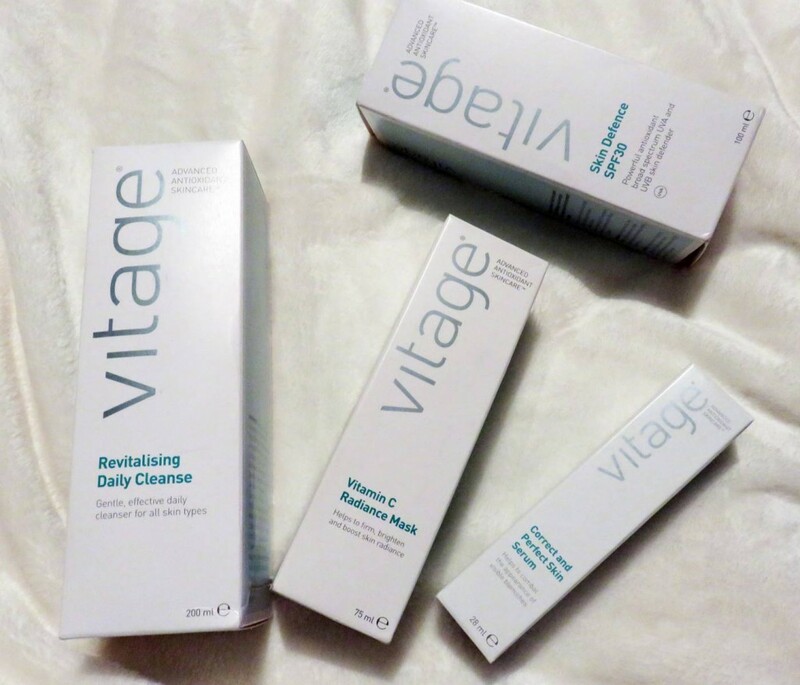 Verdict: I have no negatives about the Vitage skincare range, mainly due to the fact the skincare products are all gentle enough to daily for my skin, and together they effectively cleansed, moisturised and treated my dull skin, oilyness and breakouts. Perhaps they are a little pricey if you prefer High Street branded prices, but I do like to invest in quality skincare therefore expect a price range of around £20 per product. They all smell lovely, and the cleanser feels amazing to use due to its softening lather and clean, fresh after feel. 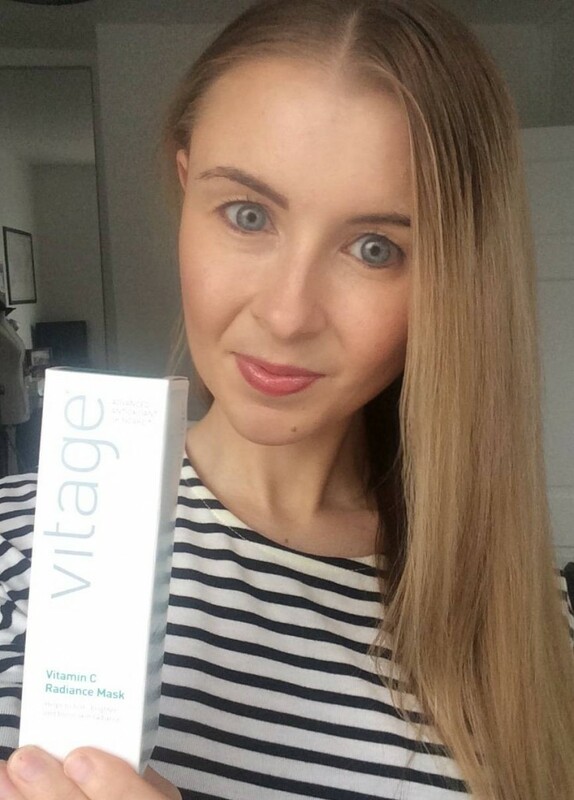 My favourite of all is the Vitamic C mask, which I’ll be switching up week after week with my usual Trilogy mask. I loved the serum too, and need to figure out whether to alternate my days using my usual moisturiser and then using the serum, as I would love to give it a longer try. Very happy with this skincare range, and feel that the majority of people who try it out too will feel the same. I see they also do a make-up and cosmetic range which I’m really intrigued to try next! Previous Post Fashion: What’s In My Beach Bag?